Wheatgrass, sometimes called couchgrass, is sprouted from wheat seeds and championed for its touted health benefits. Wheatgrass is typically juiced or consumed in powder form in capsules. Clinical studies, however, on the effects of wheatgrass in humans are scant, notes the American Cancer Society, However, wheatgrass has been used in traditional medicine to treat a range of ailments. Because wheatgrass takes seven to 10 days to sprout, microbial contamination could occur and cause harmful effects when eaten. Wheatgrass contains vitamins, A, C, E, K and all eight B vitamins, according to the Memorial Sloane Kettering Cancer Center. It also provides the minerals iron, magnesium, calcium and selenium. It's a source of amino acids, which are the building blocks of protein. Wheatgrass also contains chlorophyll, which is the pigment that makes it green. Chlorophyll is believed to increase oxygen levels in the blood, reports the American Cancer Society, but there's a lack of medical literature and clinical trials to verify this effect. A study published in "Phytotherapy Research" in 2006 tested fresh-sprouted wheatgrass and powdered wheatgrass for their antioxidant content. The scientists found that wheatgrass sprouted in nutrient-rich soil had the highest antioxidant content, compared to powdered wheatgrass and wheatgrass sprouted in regular soil and in just water without soil. They tested the wheatgrass on rat liver cells and found that the antioxidant activity of the wheatgrass reduced cell oxidation. Wheatgrass contains a compound called gallic acid, according to the Memorial Sloane Kettering Cancer Center. In fact, a study published in "Molecular Cancer Therapeutics" in 2008 found that gallic acid inhibited the proliferation of prostate tumor growth in mice. Wheatgrass also has a bioflavonoid called apigenin. In a study published in the same journal in 2008, scientists looked at the effects of apigenin on human breast cancer cells in test tubes. High doses of apigenin were found to inhibit the growth of the cancerous cells. The effects of apigenin in humans with cancer have not been determined, however. There are some reports of tumor shrinkage among cancer patients who consumed wheatgrass, but clinical trials to support these claims are lacking. Wheatgrass juice could prevent the bone marrow toxicity that chemotherapy can cause, according to a study published in "Nutrition and Cancer" in 2007. The scientists tested this on breast cancer patients undergoing chemotherapy. Some were given 60 milliliters of wheatgrass juice once a day during the first three chemotherapy cycles. 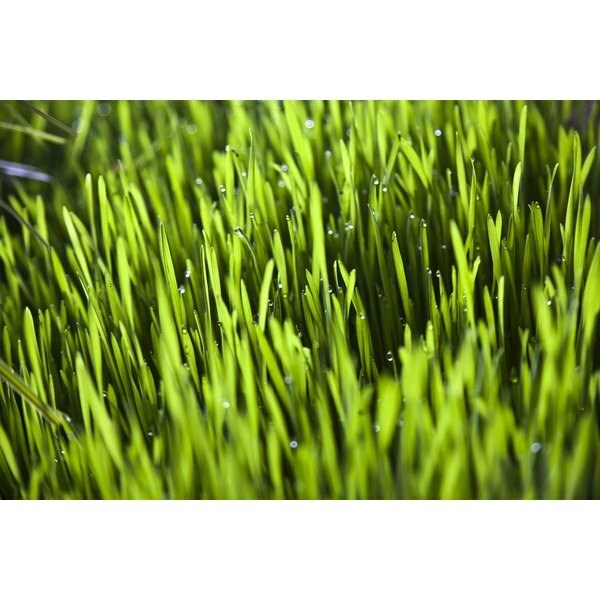 Compared with the control group who did not have wheatgrass juice, more patients in the wheatgrass juice group ended up needing smaller chemotherapy doses and ended treatment prematurely. Side effects of the wheatgrass included increased nausea in some patients. In a study published in the "Scandinavian Journal of Gastroenterology" in 2002, scientists gave three ounces of fresh wheatgrass juice to some ulcerative colitis patients who were receiving medical treatment and a placebo to other patients. The researchers found that the patients who took wheatgrass juice had reduced symptom severity, including pain, diarrhea and rectal bleeding, compared to the placebo group. The scientists concluded that wheatgrass may have an anti-inflammatory effect that can reduce chronic bowel inflammation, or ulcerative colitis. The effects of wheatgrass on inflammation in other areas of the body has not been determined.